Did Backpacker Magazine Get Women All Wrong? Soaked to the bone and still all smiles! Last month Backpacker Magazine came out with multiple female specific articles aimed at getting more women outdoors. Can’t complain about that, right? Well you can when they get women completely wrong. I never really gave Backpacker Magazine too much thought before. I have found some really great articles, but like most magazines, it is filled with tons of ads. I actually get the magazine free with an outdoors club membership. Oh you do too? You may not realize magazines practically give their subscriptions away because the money is in the ads. The more subscribers you can claim, the more companies pay for their full page spreads. Along with the introduction to women specific articles was this ad for adult products which I had never seen before. Back to the articles for women. I was actually looking forward to getting the September issue as a few hiking friends had been interviewed for an article on solo hiking as a woman. I was disappointed to find this article didn’t appear in the magazine but just on their website. What was even more disappointing was how flimsy it was being they talked to six badass women. 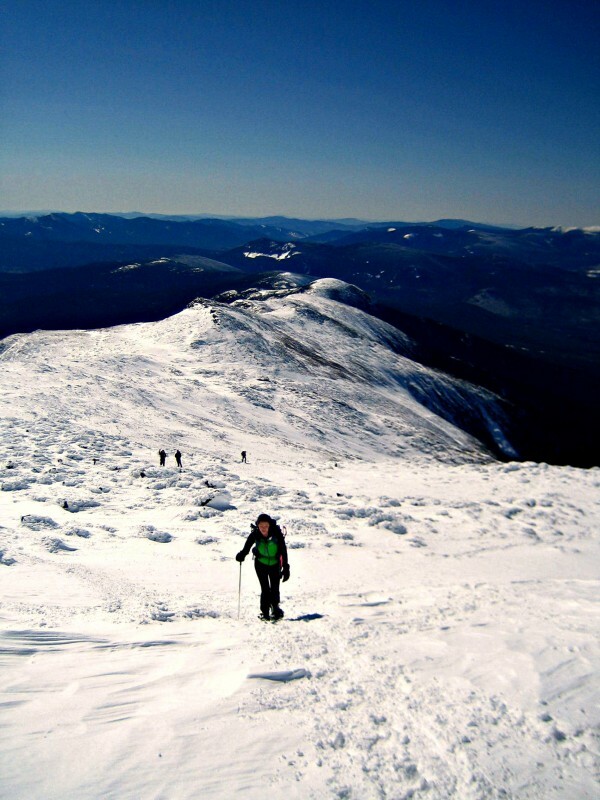 Women who hiked thousands of miles solo and have so much to say on the subject. They did eventually edit it to include 18 quotes vs the 7 they started out with. Now I am not saying all the articles were terrible. 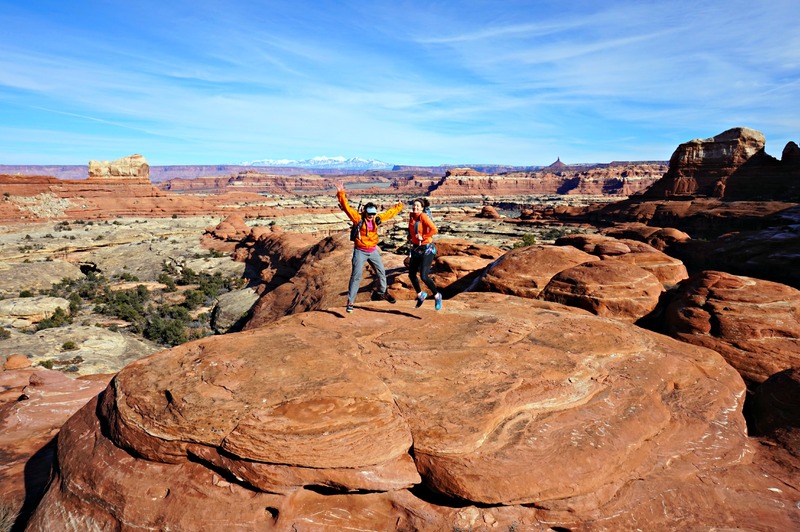 I thought 4 Reasons We Need More Female Outdoors Leaders was a good start. I hope they follow up with a focus on exceptional female outdoor leaders in future issues. I know first hand that social media requires eye catching photos or an attention grabbing line, but “how not to pee on your shoes” is ridiculous. There are many women who are curious about backpacking and need some basic information to have a successful trip, but can we act like grown ups here? Note to any guy who is trying to introduce his significant other or any female friends to backpacking: don’t demoralize her or baby her through the process. First, this advice should be geared to both men and women. Maybe titled “Help make their first trip successful” or something along those lines. This advice says not to do everything for “your honey” but hold her hand through it all. When I lead hikes I provide lots of information beforehand so every member is knowledgeable and that in itself helps people feel empowered. Instead of “let her hold the map and compass” and “show her your route” why not plan the trip together? Discuss what your goals are. Do you want to pack in that gourmet dinner and do a few miles to a great waterfall or are you bringing an experienced day hiker who wants to expand his/her skills to backpacking? If you’re bringing someone who is used to hiking 12 mile days, shorten it to two 8 mile days. Let them take part. If your future backpacking buddy doesn’t know how to use a map and compass, take a course together! 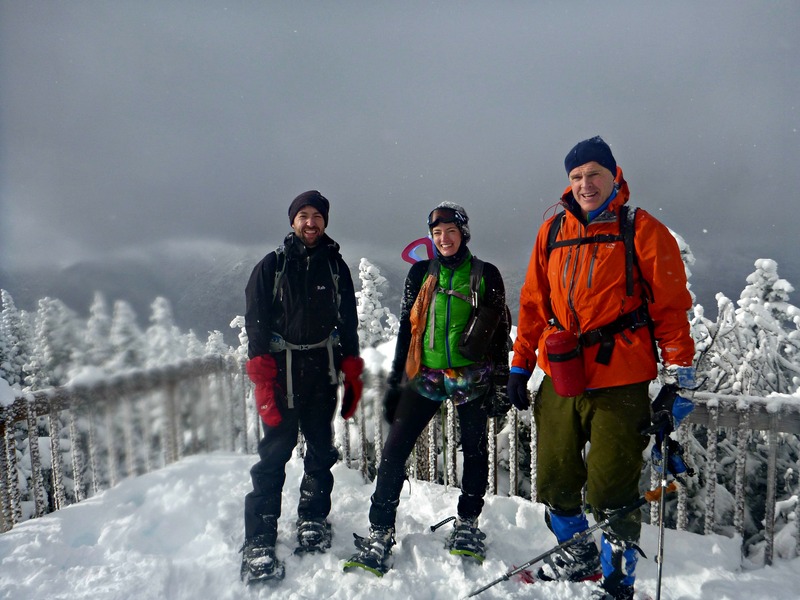 There are plenty of organizations like Appalachian Mountain Club and the Sierra Club that offer this. Let her (or him!) be your partner in planning and executing the trip, not your pet. Just two of the 6 men I led up the Wildcat Range in winter. After my frustration I decided to do my own survey and make my own women’s focused series. This month isn’t a huge change from what Trail to Summit is all about. As a female hiker and backpacker I feel a responsibility to represent other women appropriately and help educate them so we all feel confident to hit the trails. This month you will see some great features, but at the moment you can check out 13 inspirational female hikers I interviewed this past year. In my survey I asked the same questions Backpacker Magazine featured in their articles. Some of the responses were consistent while others were very different. So how did I get these responses? 1000 women answered who were in various online communities. All facebook groups which included: Women of the Pacific Crest Trail, Appalachian Trail Women’s Group, Northeast Peak Baggers (NH), Ladies of the JMT, Nature Girls, Outdoor Women, Sisters with a Traveling Backpack, and Women of Wonderland. The women in these groups have an interest in hiking and backpack (the reason for joining these groups) but also have an advantage because they know about these communities. These groups are made of both brand new and very seasoned hikers who day, section, and thru hike various trails across the United States. Backpacker Magazine (I assume) surveys their readers who range from across the United States and who are interested enough in backpacking to sign up for a subscription. Like Backpacker I also found that women sometimes had issues finding clothing that fit right. An overwhelming number of women wrote in they had issues finding pants that fit right. I began hiking in skirts, leggings, or shorts because of this. 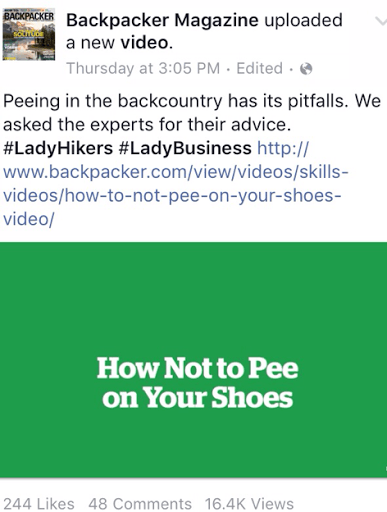 Backpacker Magazine should have enough sway to partner with a company to resolve this problem or at least write an article involving real women and what would make for ideal hiking pants. Wouldn’t that be a treat? What isn’t? This image backpacker created for their survey results. Another question I had very similar responses for was “what age did you take your first backpacking trip?” The results were spread out but the largest group- 20% answered 35-44 years of age. According to Backpacker men had responded with a much earlier age range (before they were 18). So how do we get more girls and women outdoors for longer periods of time? The answer is complicated. I would like to see Girl Scouts and other organizations for girls implement more outdoors skills training. It would also help if the entire world could stop telling women (when it doesn’t apply to men!?) that the woods are dangerous, especially going at it solo. We also need to redefine what it means to be a feminine or a woman in general. In today’s world girls play nice. Girls don’t get dirty. Girls let boys take care of them. In reality there is so much benefit to getting outdoors, especially for longer periods of time. Imagine what confidence a third grade girl would get after spending her summer backpacking with her family? But we can’t do that, it’s too dangerous. This is the end of where my and Backpacker Magazine’s results correlated. In my survey a mere 14% said they’ve never backpacked solo and never want to. 38% said they haven’t yet, but would like to. An overwhelming 48% said they had before. This could be a single overnight or long distance trip, but what matters is there are women doing it and more importantly women who would like to do it. So why haven’t some? I provided the ability to write in answers as Backpacker only provided “safety concerns” and “I like the company for social reasons”. 29% chose safety concerns which can vary depending on your location or experience. For example, someone who backpacks in Grizzly territory may feel safer backpacking with others. Some enjoy solo hiking, but like to camp with others for safety or comfort. I have only day hiked because I don’t have proper backpacking equipment, yet. Haven’t had the time/money since I got up the courage to do so! There needs to be more education, information, and resources available for those who would like to start, especially women. We need to change the perception others have that backpacking and solo hiking is dangerous for women. It is dangerous only if you don’t have the knowledge and skill set required. Backpacking is expensive and can be difficult to get into without some guidance. Solo hiking is merely a preference and not an elitist identifier. Some people have great hiking buddies to share the adventure with. Some don’t or (for many varied reasons) prefer to go solo. The biggest pitfall Backpacker Magazine made is asking women what their “Backcountry Beauty Routine” was. Now would men be asked that question? Hell no! They’d be asked (obviously) what they do for backcountry hygiene. For women hygiene is important for overall health but also include some important tips to prevent issues like getting a yeast infection. Instead of addressing these concerns many new backpackers have, they strung together a video of women talking about simply washing their face at night and wearing tinted lipgloss. That’s not a thing- hygiene’s a thing, but there’s a reason this got people into trouble. It’s an obnoxiously gendered question. beauty routine? Sounds like this question is out of the 1950s. Same as at home. Put contacts in, brush teeth,wash face, brush and re-braid or bun hair if needed. What? Seriously? You think I pack in Mary Kay? If my smell gets to me, I’ll wash my clothes and me by pouring hot water into a dry sack with a little soap. I cut my hair before going on long trips and comb it with my fingers. I do carry deodorant in a baggie. That’s a joke right? Basically I check every night to make sure I don’t have a tick, that there is no fungus anywhere and my feet are clean and dry. Lol. Not sure I understand the question, but I generally do not have one. The glow of completing a tough hike is enough. I don’t even really have a front country beauty routine. If you’re looking for a fun way to introduce your kids to hiking and backpacking, National Parks are full of great programs and offer things like mileage booklets to keep your kids excited. Looking for hiking partners? You can find a group on facebook (such as the women’s groups listed above that I surveyed) or by simply using the search bar to find a local group in your area. You can also join hikes through organizations like AMC or the Sierra Club as well as Meetup.com! Looking for a female only group? Check out Trail Dames! There are chapters across the US. 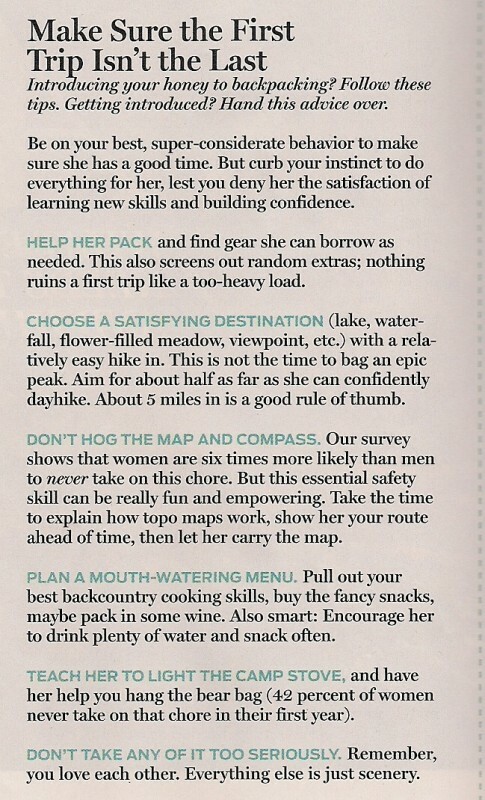 I hope Backpacker Magazine will continue to have female focused articles but learn from their blunders. I don’t think they were malicious in their intentions, but just didn’t use the resources they had properly and didn’t hand the articles to women to proof. Women belong in the outdoors just as much as men and there’s so much you can learn from them. I have a challenge for you. Let’s redefine what beauty looks like on the trail. Share a photo with us by tagging #trailtosummit and tell us what makes you feel beautiful in the outdoors. Without mirrors on the trail, beauty means so much more. What is it for you? You can share on Instagram, Facebook, or Twitter. See you on the trail, ladies! Looking for some information to really prepare you for the trail? Learn how to dig a proper cathole and what you need to know about trail hygiene specifically for women. I have spent the last 15 years leading San Diego Girl Scouts on backpacking adventures. I am one of 8 volunteer trainers who teach our progression of classes (Wilderness Hiking, Basic Backpacking) and guide Advanced Trips. This is a Council-wide program — that is, we aren’t leading troops, but Girl Scouts (including adults) all over San Diego County sign up for our trainings and trips. We train 300-400 individuals every year, and we get quite a bit of enrollment from neighboring counties (LA, Orange, Riverside) since they don’t have developed backpacking programs in their councils. I was sorely disappointed that Backpacker — in the first column dedicated to Girl Scouts that I’ve ever seen — couldn’t manage to locate some of the highly active backpacking councils across the U.S. and just focused on the negative instead. As you’ve pointed out, the whole issue missed the mark. But you expressed a wish that Girl Scouts would do more. I just want you to know that we’re knocking it out of the park down here. 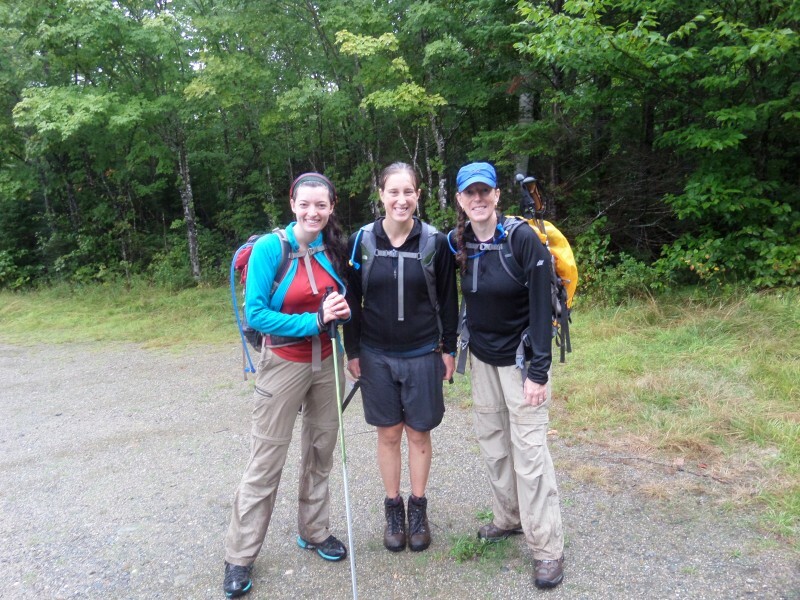 We offer a summer of trips from sea to shining sea and when our girls go off to college they carry a backpacking legacy that began here at SDGS 60 years ago. They become leaders in their university outdoor programs, go on to thru-hike the PCT and JMT, head out to the Peace Corps and become wildlife biologists. And we volunteers just keep trying to improve our game, creating more access to trainings and trips and bringing new adult trainers on board to carry the torch. So thank you for promoting independent strong women on your site. And remember, Girl Scouts DEFINITELY is where girls grow strong! Val- sounds like Girl Scouts in San Diego are doing it right! I think there are some great resources for girls to explore the outdoors like yours, but we need much more of it! Girl Scouts programs around me (in the East Coast) tend to be troop based and really depend on the interests of the women running them. Some really push getting a wilderness experience while others sadly just focus on arts and crafts and cookie sales. I’m not saying the arts aren’t important but all girls should experience the kind of empowerment backpacking gives you. Keep up the great work! Wow! Really on point. I am really glad to see your response to Backpacker Magazine. It is beautifully written and exactly what they needed to hear. I hope they make some changes to their articles focusing on women in the future. They should just hire you to write them! Thanks Emily! I am hoping they take in consideration the feedback given and write some articles on what women really need to know to be successful on the trail. Thank you thank you, Allison! I could not have said it better. 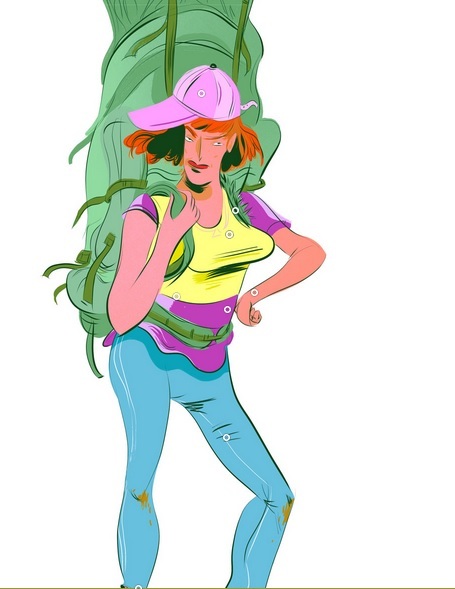 Female hikers should be taken seriously. Keep up the great work and I can’t wait to see your other posts!! Thank you for the feedback! I’m excited about this whole month! Thank you for this article and posting the responses. I am now 70 years old and one of my regrets was not pursuing my dream to backpack. I remember going into a sports store and trying on backpacks and dreaming of hiking. However, none of my friends were interested and I did not know how to start. This was the early 70’s and there wasn’t much available. I could not afford Outward Bound. So my interests went elsewhere. My oldest niece has hiked the John Muir trail solo and I am so proud of her outdoor exploits. I love what the San Diego Girl Scouts are doing for their members. Four years ago, I bought a small RV and I travel in it solo. My best moments have been in it somewhere in an Oregon state park or driving along the Snake River in Idaho. I applaud your encouragements to women of all ages to get outdoors. It has been a life saver for me. Thank you. Loved the article! I’ve been backpacking/hiking for years and when I met my wife she had never been but wanted to. I accidentally picked a pretty extreme/difficult hike for our first backpacking trip and she killed it. Not only that but she had to encourage me to keep climbing to one of the summits because I was pooped. Women are incredible and should be treated as such. Thanks for the reminder! I haven’t thought much of Backpacker for years. They are out to sell stuff, not help hikers at all. Just my opinion of course. Gave my subscription up after the second year of their current format, and never looked back. This is Joan Young, first woman to hike all of the North Country Trail. Thanks for reading Joan! I’d love to talk with you about your experience on the NCT. I’ll shoot you an email! I haven’t read any of the articles in full, but I have seen a lot of thoughts/opinions floating around the internet. Honestly, I can see a bit of where both sides are coming from — there is a really wide range of skills when it comes to any backpacker, man or woman. Which is exactly why you’ll have some people looking for beauty routines in the wilderness and others laughing at the idea. But, really, how is that specific to backpacking? You can find that dynamic in any work place or college lecture hall — some women won’t leave the house without mascara, others have never worn it. It’s just make up and it’s just a question/concern from someone looking to spend more time outside. Can’t fault them for that, right? Just like make up preferences isn’t specific to backpacking…the wide range of backpacking skills, from “never done it, it’s intimidating” to “every chance I get!”, is not specific to women. It’s a human thing. And while I do appreciate the attention to my gender I don’t understand why we have to separate the two. Like I said, I can see where both sides of the spectrum are coming from…but I feel like I am watching the divide between men/women grow bigger, rather than smaller, with all of the gender based content popping up lately. Just an observation, in general. Thanks for sharing your thoughts, Heidi! I agree, there is going to be a wide range of experience and comfort and I’m all for educating everyone. I know Backpacker will be focused mainly on newer backpackers/folks looking to do one big trip every few years but the wording and the angle they took really put me off. I’ll have some basic how-to articles this month- how to dig a cathole, a look at different menstrual cups, women’s specific gear, and much more. These kinds of articles should be accessible to new hikers but also be informative- not just catch the reader’s attention. I feel like after reading backpacker’s articles I didn’t see much that new hikers and backpackers could’ve walked away with. Those are great topics! As someone who has worked behind a company blog [for an outdoor gear retailer, no less] I may be a bit more sympathetic toward Backpacker…coming up with awesome concepts/ideas is easy compared to getting them through the red tape! A lot of the topics you mentioned were discussed for the company blog but never saw the light of day because they were too…forward? I don’t know, it’s really quite sad. Hopefully this post gets back to Backpacker, maybe the original writers/editors can use it as leverage to support more in-depth articles in the future. You really hit the nail on the head. I never had time to look at them in depth, but I am glad I didn’t. That beauty routine one got the stink eye and pass over. I’ve gotten as far as I can because I am hardheaded and want to prove I can do it. Better articles would have been on foot pain, water management, and easy freezer bag meals. Even rating ear plugs. Except for the hygiene, there is not much of a difference. We do not need to be coddled or watched over. And makeup? Please, just be happy I showered before I left. One group that helped me was Trail Dames. They are mostly in the South, but they really help women of all abilities get out, hike, camp, backpack, you name it. And they introduced me to Roam the Woods which took me out on my first backpack, complete with pouring rain and setting up camp at a stealth site along the AT. I survived and enjoyed the experience. Still a bit of a princess, but I can get dirty and be OK with it. I agree! I find it hard to write women’s specific articles ’cause it’s pretty much the same as it would be for a guy. I have a friend that runs one of the Trail Dames group. Sounds like a a lot of fun!